Zhanjiang is one of 15 cities in the southern province economic zone of mainland China, and is close to Hong Kong situated in the delta of the Pearl River system. Zhanjiang is the major southern port and west of the region's capital Guangzhou (Canton) in Guangdong region. The peninsula city is the focus of a large mining and mineral exploration region as well as the port gateway to some of the largest agricultural producing areas in Southern China. China has 34 regions of which the Guangdong covers a staggering 180,000 square kilometres. Zhanjiang enjoys rich oceanic resources and abundant petrol oil reserve. It has achieved robust economic development. Petrochemical industry, offshore oil exploration, processing of agricultural and marine products, electricity, paper making, feedstuff, textile, electric appliances and machinery have become its 8 pillar industries. It's the production base for Southern Petroleum Co. Ltd., agricultural and marine product processing, high-quality paper making and small household appliances manufacturing. Zhanjiang is one of the four major sugarcane yielding centers in China, with its sugar output reaching 1.2 million tons in 2006. In addition, Zhanjiang grows amount of eucalypt, sisal and mangrove in China. 21 manufacturing bases for 5 categories of agricultural products have been built here. Important links have been established focussing on reciprocal visits and exchanges in education, technical engineering, arts and cultre. The 37-hectare Sino Australia Friendship Garden in Zhanjiang opened in 2007 and features many species of exotic flora native to Cairns and the Tropical North. Zhanjiang lies in the southwest of Guangdong Province. It is situated in Leizhou Peninsular, neighboring the South Sea in the east and Beibu Gulf in the west. The city is separated from Hainan Province by Qiongzhou Strait. Most of the land of Zhanjiang City is peninsular or islands. The terrain slopes downward from the north to the south. A plain forms the major area of the city. Its mountainous area is in the northern part of the city. The population of Zhanjiang is approximately 7 million (2010). The average winter temperatures range between 8 and 17 degrees with summer temperatures between 25 and 29 degrees. The local time of Zhanjiang is Greenwich Mean Time (GMT) +8 which is two hours behind Cairns. The agreement with Zhanjiang was signed on 25 August 2004. According to the principle of equality and mutual benefit, the two parties shall carry out a wide range of exchanges and cooperation in economy, trade, tourism, education, culture, environment and urban planning, etc. in order to promote common prosperity and development. Signed on August 25, 2004 in Zhanjiang City, this Agreement is effective upon the date of signature. 2017 - Deputy Mayor Terry James leads an economic development delegation, including representatives from Tourism Tropical North Queensland and Study Cairns, to Zhanjiang in December. 2016 - Cairns Sister Cities Ambassador Sim Hayward visits Zhanjiang in November. 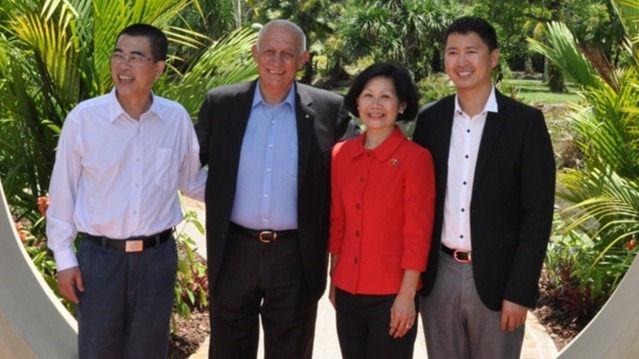 2015 James Cook University Cairns Campus signs a Memorandum of Understanding with Guangdong Ocean University, Zhanjiang, during a delegation visit to Cairns in November. 2014 Two students from Zhanjiang travel to Cairns as part of Youth Ambassadors Program. 2007 Cairns and District Chinese Association Incattend Zhanjiang 2007 Winter Camp. The Zhanjiang Friendship Garden was officially opened on 21 November 2015, celebrating the Sister Cities relationship between Cairns and Zhanjiang. Mayor Bob Manning officially opened the Zhanjiang Chinese Friendship Garden with Mr Huang Guang, the Vice Secretary General of Zhanjiang Municipal People’s Government. The Zhanjiang Friendship Garden is situated on the banks of Freshwater Lake, within the Centenary Lakes precinct at Edge Hill. It incorporates traditional features in a contemporary style. The entry pillars announce “arrival” and are adorned with graphic motifs of traditional cloud patters of Zhanjiang. Boulders of Chillagoe marble acknowledge the importance of rocks and mountains in Chinese garden culture.